Now that I have my cheesy word-play on the title, to demonstrate one inherent trait of asynchronous programming, out of the way, let’s talk about asynchronous programming in C# and .NET and some of the common misconceptions around it. .NET Programmers have traditionally shied away from writing asynchronous code, mostly for good reason. 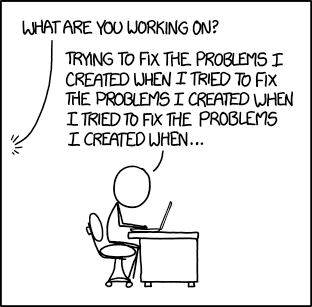 Writing asynchronous code used to be arduous work and the result was difficult to reason about, debug and maintain. That became exacerbated when you threw concurrency into the mix – parallel or asynchronous – as that’s harder to consciously follow for our brains which are, or at least trained to be optimised for, non-concurrent and sequential logic. This has resulted in a trend of more and more asynchronous code popping up in our code-bases. That’s mostly a good thing, because leveraging asynchrony in the right place can lead to significant performance and scalability improvements. However, like any other magic, not being aware of what goes on under the hood can lead to myths, misuse or gotchas that end up biting you. I’ll go over some of them below which I encounter often in my consulting work. This has likely been the most common misconception in my experience. I’ve heard many varieties of the above statement over the years. Overloading of terms like asynchronous, concurrent and parallel and incorrectly using them interchangeably can take some of the blame. Although, the situation has improved a lot recently, thanks in large part to Stephen Cleary and his continued evangelism of async/await best practices in .NET and how the internals work which I highly recommend reading. 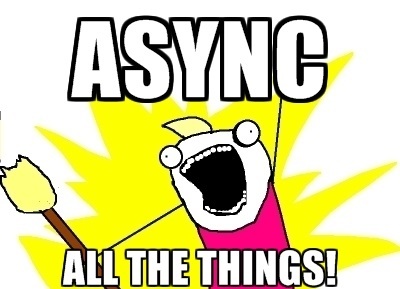 async doesn’t magically make your code asynchronous. It don’t spin up worker threads behind your back either. In fact, it doesn’t really do anything, other than enable the use of the await keyword in a method. It was only introduced to not break existing codebases that had used await as an identifier and to make await usage heuristics simpler. That. Is. It. await is a bit more complicated and is quite similar to how the yield keyword works, in that it yields flow of control back to the caller and creates a state-machine by causing the compiler to register the rest of the async method as a continuation. That continuation is run whenever the awaited task completes. That’s the gist. But the compiler actually emits slightly more complex code which also includes short-circuiting the continuation when a task synchronously completes. None of that involves spinning worker threads. It also doesn’t magically make your task’s implementation asynchronous. In fact, if the implementation is synchronous it all runs synchronously, but slower, which brings us to the next misconception. As we saw in the previous section, async/await generates a state-machine and significant extra code which involves extra heap allocations and context switches between different execution contexts. As you can imagine, all of that comes with some overhead which inevitably makes asynchronous code run slower than a synchronous counterpart. That’s not to dismiss the performance benefits that can come with correctly used asynchronous code, which can be significant. However those benefits aren’t about execution time. In rich client applications which have a UI thread, or single-threaded applications, it’s about responsiveness. Because you don’t block the main thread while waiting for an inherently asynchronous operation and freeze the app. It’s a different story in ASP.NET web applications and APIs. ASP.NET request processing is inherently multi-threaded with a thread per request model. Releasing the thread when awaiting an asynchronous request in an API call doesn’t directly create a more responsive experience for the user because it still has to complete before the user gets the response. The benefit here is about scalability and throughput. Threads are maintained in a thread pool and map to limited system resources. Depending on many different factors, the underlying scheduler might decide to spin more threads and add to this pool which involves some microseconds of overhead per thread. That may seem insignificant, but for an ASP.NET API serving a lot of users, it can quickly add up to significant numbers. By releasing the thread when it’s idling for an IO-bound work to complete, it can be used to serve another request. It also protects against usage bursts since the scheduler doesn’t suddenly find itself starved of threads to serve new requests when it will have to continuously create new ones. This means your API can make the most use of available system resources and deal with a lot more requests before it falls over. However, you only get these benefits when you leverage truly asynchronous code on inherently asynchronous IO bound operations that have a significant latency like reading a file or making a network call. If asynchronous code is used for processing synchronous operations, or even asynchronous operations that are guaranteed to complete in less than a few milliseconds, the overhead will outweigh the gains and result in a worse performing API. In one benchmark this detriment was measured to be about 300% in total execution time, 600% in memory and 25% in CPU usage. So give it a second think before making that next method async by default. Horses for courses. Don't wanna be that guy, but you mean concurrent. Async = non-blocking. Since asynchronous code does not involve worker threads then that means unless you mix in multi-threading you can’t have concurrency right? Truly asynchronous operations can be concurrently processed by one thread. Heresy you say? How can one thread process multiple operations at the same time! That’s possible because IO operations leverage IOCP ports at the device driver level. The point of IO completion ports is you can bind thousands of IO handles to a single one, effectively using a single thread to drive thousands of asynchronous operations concurrently. For me it prints about 1500 on average. What do you think happens if we change the code to instead of awaiting each call one by one, fire off all of them and await the combination of all those tasks? For me it prints on average about 300. All with one worker thread. Go ahead and run it for yourself. That’s because as soon as each call is fired and registered on a completion port, while it is “in flight”, the next one fires. That’s also the same reason why doing something like the above with tasks that use an EF context to query the database will cause EF to blow up with a DbConcurrencyException saying concurrent queries on the same context aren’t supported. While it’s a good idea to have asynchronous code in the whole call stack so you don’t have blocking code that defeats the purpose of going async, you don’t have to actually use the async/await keywords unless you need to. This isn’t just for aesthetics. The simplified version is actually more efficient. Because it avoids creating an unnecessary state-machine and the extra heap allocations. Hopefully this helps debunk some of the most common misconceptions about the magic of async/await in C# and .NET. Integrating systems over a good messaging infrastructure has many benefits if done right. Some of these are system decoupling and platform agnosticism, independent scalability, high reliability, spike protection, a central place to keep an eye on your integrations and more depending on your situation. Many of these benefits are vast topics on their own. But the point of this article is to go over some of the pitfalls when implementing large-scale integrations over a messaging infrastructure and guidelines for avoiding them. These are based on my learning from a recent project which involved improving a client’s existing integration between 5+ large systems. While the messaging infrastructure in use was the Azure Service Bus, I believe many of these points could apply to all other message-based integrations and service buses. Not rolling your own should really be common sense in all projects, yet you still see it unnecessarily done more often than you should. Unless your aim is to actually provide a competing solution that works better than what’s available and you have the resources to do so, you will get it wrong, not think of the edge cases, and it will eventually cost you more as your efforts are diverted from delivering business value to maintaining your custom solution. So stand on the shoulder of giants as much as you can and use tried and tested infrastructure that’s already available. This is closely related to the previous point and includes plugging in your own service bus-esque solutions alongside a proper infrastructure like the Azure Service Bus, for example, storing messages in a database table for later processing. Proper locking of the message when it’s being processed, to prevent duplicate processing. Implementing your own locking mechanism on a database table is complex, error-prone and can easily cause dead-lock situations. Scaling and performance. Even if you get the locking right, it won’t be nowhere near as performant as a proper message queue for high traffic scenarios. You’ll have a high-write, high-read situation (a lot of messages coming in and a lot of polling) which is very hard to optimize a SQL database table for. Availability and reliability. A good messaging platform like ASB, is highly available and redundantly stores your data. Filtering, dead lettering, automatic expiry and a myriad of other features that come with ASB. This will lead you to the pitfall #1 from above: in order to get it right, they had to essentially roll their own messaging infrastructure, so they ended up with two problems instead of solving the first one. Treat the root problem, not the symptom. An exclusive topic/queue for sending a single system’s customer update messages, effectively creating a point-to-point integration. This might look fine if you’re only starting with a couple systems, however not going down this route is critical for future maintainability. Single points of failure. 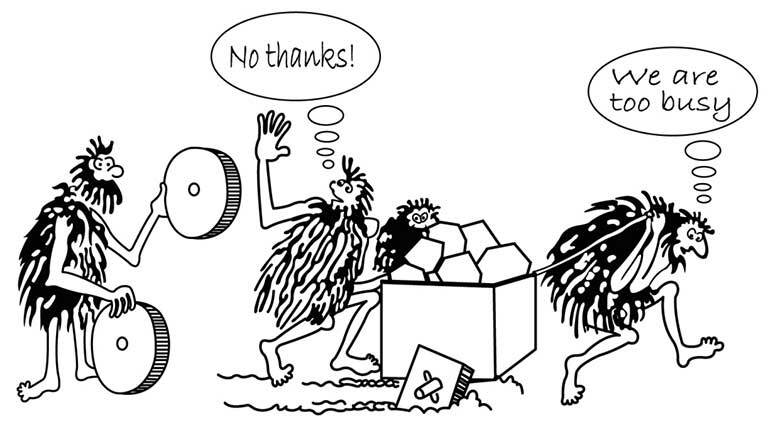 Each of the systems being slow or unavailable breaks the link and the data no longer flows to the next system. This actually caused one of the client’s main systems to have data that was weeks old until the faulty system was properly fixed and processed its backlog of messages. 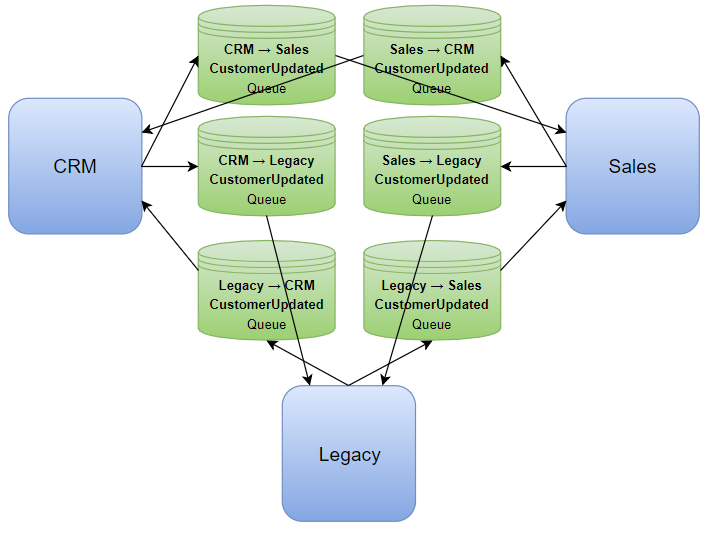 If, some time later, you add a third integration between the legacy system and CRM like the diagram, all of a sudden you have inadvertently created an integration between all of the systems by forming a circle which may not have been your intention. It also becomes much more difficult to reliably stop infinite loops from happening between all the systems involved where one message keeps going round and round. This can result in invalid data and even more resources being wasted. More on this below about having a mechanism to stop infinite message loops. With only 3 systems and one simple message, this is already looking like a mess. As you add more systems and integrations, it becomes exponentially costlier and harder to develop and maintain. There are many flavours to these point-to-point integrations and each come with their own myriad of problems. The publishers don’t have to know about the other systems. Any interested system can subscribe to the topic, effectively getting its own queue. By using this approach, you further decouple the systems, keep it extensible for plugging new systems and keep complexity and maintenance costs linear. If subscribing systems need to know where a message originated from, that can be included in a standard message body format, or better yet, message properties as they can drive filters and actions. It’s very easy to cause infinite loops that can wreak havoc on all the systems involved. 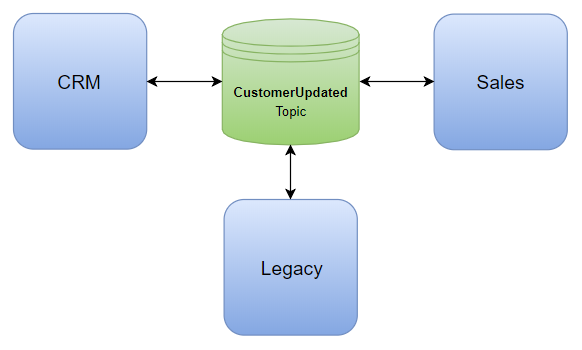 From the above example, it can easily happen if each system received a message from the topic, updates a customer and as a result republishes a CustomerUpdated message back to the topic. A simple solution to this problem that works with the above pub-sub model, is that a system’s action based on a message received from the topic, shouldn’t cause the same message to be republished back to the topic. Each message should have a timestamp. Not the one that is automatically stamped on messages by the service bus, but one that your system includes in the message. The timestamp should describe when the event the message describes happened within that system. This provides a means for other systems to not act based on outdated data. e.g. it’s possible that by the time a subscribing system receives a CustomerUpdated message, it’s already applied a more recent update. A simple timestamp check can prevent the more recent data from being overwritten. While you’re at it, make that timestamp a UTC one so you don’t run into time zone conversion and datetime arithmetic issues. You only care about the instant when something happened, not the local time, and a UTC datetime simply represents that. All necessary information from the publishing system should be self-contained in each published message. That means all the information the subscribing systems need to be able to act on the message. A simple example of this is the CRM system publishing a CustomerUpdated message that only says a specific customer’s email address has been updated, without including the updated email. Then the Sales system maybe makes a call to a CRM API to retrieve the updated email address. 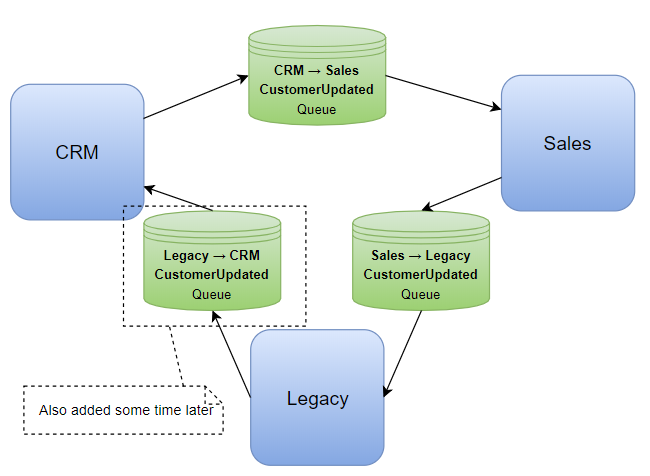 However, by the time that message is processed by Sales and the call is made, the customer may have been updated again in CRM, resulting in data inconsistency. This major anti-pattern not only introduces flaws and invalid data, but takes away many of the benefits of using a service bus in the first place, such as system decoupling. So keep and treat messages as the single source of truth. On the other hand, don’t include unnecessary information and keep them lightweight to make the most of your topic space. As the integrations within the service bus namespace grow it remains easy to find the target topic and subscription. You can see what’s going on in your service bus namespace when using an external tool like the Service Bus Explorer. It can potentially drive an automatic monitoring tool that can visualize all the integrations and the flow of data. Like most conventions, the value mainly comes from there being one, rather than the convention per se. Integrations, once in place, shouldn’t just become part of a black box that’s your service bus. A subscription’s incoming rate becomes consistently higher that its processing rate. This should be fine for short periods of time e.g. traffic spikes. However if it continues your topic would eventually get full. A topic’s used space is consistently increasing. A subscription’s dead-letter queue message count is consistently increasing. The above are closely related and are usually a sign that a subscribing system is unavailable or having stability or performance issues. These issues need to be dealt with ASAP. Depending on how the publishing systems can cope with the topic they’re publishing to being full, it could also lead to problems in those systems. For the client, this actually accumulated a backlog of failed tasks in a publishing system that was limited and hosted externally. It was hopelessly retrying over and over, unnecessarily using significant resources which affected other parts of the system such as delays in sending important marketing material. In the meanwhile, to stop the topic from getting full, you could set up forwarding to redirect messages for the problematic system to a different backup topic subscription or queue until the problem is resolved. Just don’t move them to a database. Azure Monitor can help here. Having structured logging of important information to a centralized logging server such as Seq can also be really beneficial, however, be careful not to create a lot of noise by logging the world. By the engine itself as a result of your messaging entity configurations, e.g. automatically dead-lettering expired messages or filtering evaluation errors. By the engine itself as messages exceeds maximum delivery count – which is 10 by default. For example, your subscriber receives the message, but fails to process it, maybe due to an exception. Due to the subscriber’s request in message processing code. See here for a complete list and their details. These dead-letter queues contribute to the overall used space of the topic, so an operator should keep an eye on them, using your monitoring tools, and empty them regularly via either resubmitting them if they were due to transient errors, or discard them if they were poison messages. 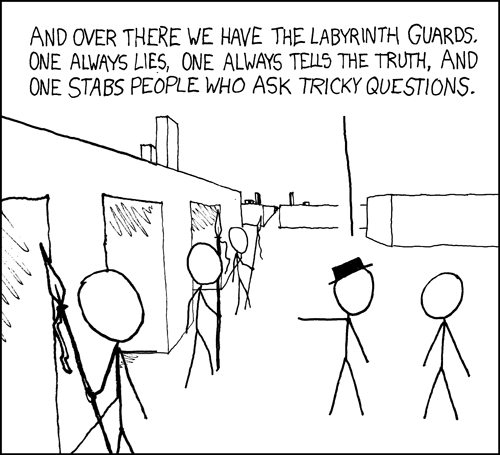 Use AMQP and avoid HTTP polling. This should be the default if you’re using the new .NET Standard Service Bus Client library, you can read about the benefits here. Also be careful to not use the old library – most of the documentation around still point to that. Use the asynchronous callback-based message pump API. Sending/receiving messages to/from the message broker is an inherently IO based asynchronous operation – you shouldn’t hold up threads for them. Process messages concurrently. Many programmers shy away from writing concurrent code, as it is more complex and error prone. That’s usually a good approach, however the free lunch has long been over, and this is one of the scenarios where having concurrent code really shines. Concurrent code doesn’t mean you have to do unnecessary multithreading. If you use the asynchronous APIs and leverage truly async code where possible, even a single thread can accomplish orders of magnitude more. This needs to be accompanied by proper asynchronous synchronization so you don’t, for example, process two messages for the same customer simultaneously. Keep connections to the service bus alive (i.e. the clients) and don’t recreate them as that’s expensive. They are designed to be kept alive and reused. Leverage prefetching with a message lock duration that’s tweaked based on message processing times. When using the default lock expiration of 60 seconds, Microsoft recommends 20 times the maximum processing rate of your subscriber. e.g. if the subscriber processes 10 messages per second the prefetch count could be 10 x 20 = 200. The idea is to prefetch comfortably below the number of messages your subscriber can process, so they aren’t expired by the time it gets around to processing them. You can read more about that here. Use partitioned topics. One of their biggest benefits is they can go up to 80GBs in size compared to just 5GBs for unpartitioned ones. That can give you a lot more time to deal with issues explained above and you almost never need to worry about them getting full. But they also have better throughput, performance and reliability. There’s really no good reason for not using them. By combining the above, I was able to improve the processing time per message on a critical subscription for the client from ~15 seconds to ~3 seconds and total messages processed per hour from ~240 to ~12000. It’s only a matter of when, not if, that your messages need to be changed. To make moving forward easier and seamless, have a message versioning strategy to start with and make those changes in a backward compatible way. Prepare yourself for the situation that different subscriptions of a single topic contain different message versions. This allows subscribers to be upgraded at their own pace, while not blocking those that can process the new version. Old message versions can ultimately be retired when all subscribers are upgraded. Even with other measures in place such as duplicate detection. It’s very likely that your subscriber receives the same message twice. For example, this can happen when during the time a subscriber is processing a message, its lock expires and the message is released back to the subscription queue. So you have to make sure your subscribers process messages idempotently. This can be achieved via various mechanisms depending on your circumstance, but checking against message timestamps or unique message IDs can be a simple effective measure. In conclusion, service buses, like any other tool in our toolbox, can be misused or abused, perhaps more easily than some of the others and that’s led to many hating them. But in the right situation they are very powerful. Following the above guidelines should hopefully help you build a solid foundation for large-scale integrations over service buses and not end up with huge improvement costs. Because changing upstream design always costs exponentially more downstream. The LINQ expression ‘foo’ could not be translated and will be evaluated locally. I dug around in the code and found the responsible queries. Some of them were quite complex with many joins and groupings, while some of the other ones were very simple stuff, like someStringField.Contains("bar", StringComparison.OrdinalIgnoreCase). You may have spotted the problem right away. StringComparison.OrdinalIgnoreCase is a .NET concept. It doesn’t translate to SQL and you can’t blame EF Core for that. As a matter of fact if you run the same query in full-blown Entity Framework, you’ll get a NotSupportedException telling you it can’t convert your perdicate to a SQL expression. And that’s a good thing! because it prompts you to review your query, and if you really want to have a predicate in your query that only makes sense in the CLR world, you can decide if doing a ToList() at some point in your IQueryable to pull down the results of your query from the database into memory makes sense. And when you have your results in memory you can continue with your query shenanigans without having to worry if the rest of your query is translatable to SQL. Or you may decide that you don’t need that StringComparison.OrdinalIgnoreCase, because your database collation is case-insensitive anyway. The point is, by default, you are in control and can make explicit decisions based on your circumstance. Not anymore in Entity Framework Core. Apparently there’s this concept of mixed client/server evaluation in EF Core. What it effectively does is if you put stuff in an IQueryable LINQ query that can’t be translated to SQL or a query in your underlying database, it tries to magically make it work for you, by taking the untranslatable bits out and running them locally! and it’s enabled by default! It’s not hard to imagine the performance repercussions of that on any real-sized application with a significant number of users. It can easily bring down applications to their knees. Compare that to the full Entity Framework where you get an exception. The fact that this hugely different behavior is the default is mind blowing! You could argue that it’s the developer’s fault for including something like StringComparison.OrdinalIgnoreCase in the IQueryable prediate. While that’s true, you can’t blame people newer to EF for expecting something like that to magically work. Especially since it does! for more senior devs it can easily sneak past unnoticed when context switching between LINQ-to-entities and LINQ-to-objects. Also, having untranslatable things like StringComparison.OrdinalIgnoreCase in your query isn’t the only culprit that results in client evaluation. If you have too many joins or groupings, the query can become too complex for EF Core and make it fall back to local evaluation. I believe languages and frameworks should always make it harder to make mistakes, especially ones like this with potentially devastating consequences, so I strongly disagree with this new default behavior and will be keeping it disabled. I rarely use tools that generate code, however, one that has become a fixed asset of my programming toolbox is Visual Studio’s class designer. It’s a great productivity tool that helps you quickly visualize and understand the class structure of projects, classes and class members. It’s also great for presentation of code-base that does not come with a UI, e.g. a Class Library. It also lets you quickly wire-frame your classes when doing top-down design, but it is limited in that aspect, for example it does not support Auto-Implemented Properties, which I tend to almost always use in my Types, instead it blurts out a verbose Property declaration along with a backing field. Fortunately, almost all of these issues are fixed with the great Modeling PowerToys Visual Studio add-in by Lie which turns Class Designer into an amazing tool. To install the add-in, extract the ZIP file contents to %USERPROFILE%\Documents\Visual Studio 2013\Addins and restart Visual Studio. Please note that I’m not the author of this add-in, I merely upgraded it for VS 2013.